A whole lot of bass for this price tag: recommended. Mighty bridge and control system. 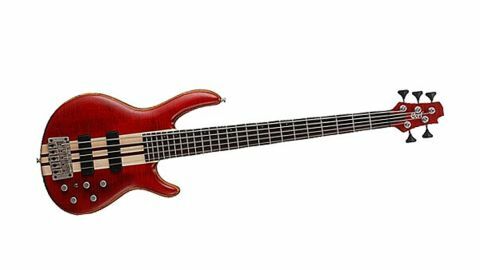 We review a lot of basses here at MusicRadar from the low- and high-budget end of the spectrum. It's obviously fun to play an instrument that costs as much as your annual mortgage. It's also fun to try and get decent sounds out of a chunk of sub-£150 plywood: you never know what marvellous tones lurk beneath the bonnet of the cheapest-looking bass. Have no fear, there's nothing lightweight about the inexpensive A5. In fact, it has a feeling of solidity that more than a few pricier basses lack, from the firm-feeling Hipshot tuners down to the huge through-body Trans Tone bridge, a true monster. There's nothing lightweight about the inexpensive A5. A quick examination of fret ends and the pickups reveals no evident flaws, and the finish is pristine from the hips, via the neck-through zone through to the neck. The A5 Plus's B string isn't the hugest we've heard around these parts, although it's acceptable: pump up the bass boost in active mode if you want to give it a helping hand. In fact the passive tones are a little boring, if we're honest, so give them a leg up and dial up that active EQ with alacrity. You'll find yourself with a range of options that few sub-£800 basses, especially mass-produced East Asian instruments, offer. This bass offers yet more proof - as if anyone needed it - that performance can be had without the need for bankruptcy. To get an instrument of the A5's calibre for a mere £700-ish is always gratifying. Give this bass a play with our whole-hearted recommendation: if this were the general standard for the mid-price market, we'd want to hear a lot more basses like these.